In the late 1980s, Alice Yu, M.D., at the University of California, San Diego Medical Center, began testing an approach that used laboratory made antibodies, called monoclonal antibodies, as a treatment for neuroblastoma. Monoclonal antibodies are designed to target a specific protein or cell. Dr. Yu's immunotherapy treatment went through many versions before reaching its current standard, a monoclonal antibody ch14.18 - a chimeric monoclonal antibody composed of a combination of mouse and human DNA. In 2001, Dr. Yu and colleagues in the Children's Oncology Group, part of NCI’s National Clinical Trials Network, tested the ch14.18 monoclonal antibody on 226 neuroblastoma patients. The treatment was given to children who already had responded to initial treatment with chemotherapy, radiation, and stem cell transplantation. The ch14.18 antibody was administered along with two immune-stimulating agents, GM-CSF (granulocyte macrophage colony stimulating factor) and IL-2 (interleukin-2), to increase the effectiveness of immune system killing of the tumor cells. Several groups within NCI were involved in this discovery to commercialization story. In 2001 the Children’s Oncology Group, part of NCI’s National Clinical Trials Network, collaborated with Dr. Yu to conduct tests of ch14.18 on 226 patients with neuroblastoma. Next, NCI’s Biopharmaceutical Development Program (BDP) at the Frederick National Laboratory for Cancer Research produced ch14.18, for the NCI-sponsored clinical trials that proved the drug’s effectiveness against the disease. When no pharmaceutical company was willing to manufacture the anti-GD2 (ch14.18) antibody for the clinical trial, NCI began producing the antibody itself. Once its effectiveness was proven, NCI increased production of the antibody to ensure availability for every child with neuroblastoma who is eligible for the treatment. In 2010, NCI entered into a Cooperative Research and Development Agreement with Maryland-based United Therapeutics Corp., under which the company assumed responsibility for manufacturing dinutuximab and moving it through the steps required for regulatory approval. As part of the dinutuximab approval, UTC will conduct additional studies to gather more information about the product's safety, efficacy, and optimal use. UTC took the product to licensure to manufacture and market Dinutuximab (ch14.18) under the brand name Unituxin. UTC also collaborated with the NCI - the Children’s Oncoloy Group and the BDP – in the clinical trials that led to FDA approval. TTC lead a focused-marketing campaign to identify a partner capable of continuing the manufacture of Ch14.18 and performing the clinical studies necessary for filing an NDA. As part of that effort, TTC wrote the advertisement of a CRADA opportunity and provided extensive technology transfer guidance and agreement support in NCI's selection of a collaborator. TTC also negotiated and managed a CRADA and several other related TT agreements that allowed for transfer of the NCI BDP's evolving drug production process. The TTC-negotiated CRADA realized the transfer of the NCI BDP’s evolving drug production process and supported transfer of the data from the Division of Cancer Treatment and Diagnosis (DCTD)-sponsored clinical trials of Ch14.18 that was instrumental in attaining FDA approval of Ch14.18 as a treatment in children with high-risk neuroblastoma. 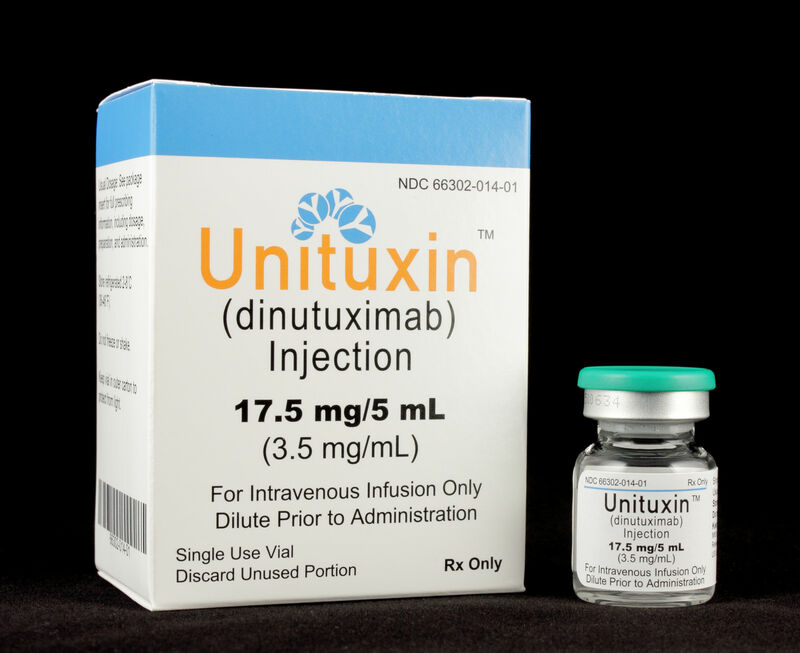 On March 10, 2015, the U.S. Food and Drug Administration approved Unituxin™ (dinutuximab or monoclonal antibody ch14.18) as part of first-line therapy for pediatric patients with high-risk neuroblastoma, a rare cancer that most often occurs in young children. In August 2015, the European Commission granted authorization for the marketing of Unituxin™ for treatment of pediatric neuroblastoma. NCI was able to help realize the commercialization a new therapy for an orphan disease and the prospect for the development of other new therapies for prevention and treatment of rare pediatric cancers due in part to the FDA’s issuance of a rare pediatric disease priority review voucher to UTC. The FLC Excellence in Technology Transfer award “recognizes employees of FLC member laboratories and non-laboratory staff who have accomplished outstanding work in the process of transferring federally developed technology.” For NCI TTC, these awards exemplify the culmination of the sustained work being performed by our team every day to facilitate collaborations and realize new cancer discoveries.